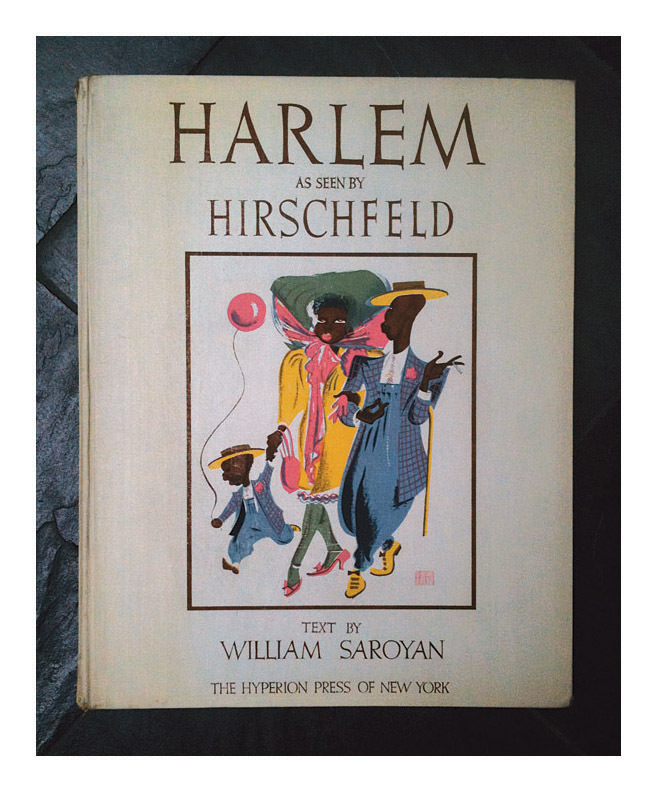 Harlem as Seen by Hirschfeld - - 1941, Book with Color Lithographs. Edition 1000, no. 423. Each print signed in the stone. 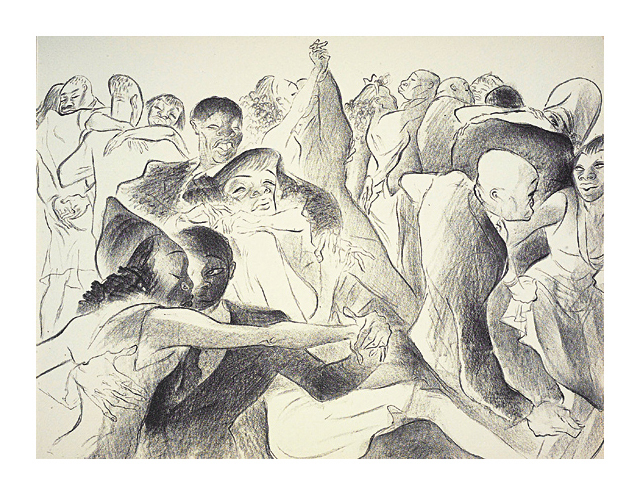 Image sizes vary; sheet size 18 x 14 inches (257 x 356). Fine, clean impressions, with fresh colors, on cream laid paper, the full sheets attached to the original support pages, with printed grey border rule. Minor discoloration to the white pictoral cloth cover, some splitting at the top and bottom spine corners, the interior fine and clean; in excellent condition. 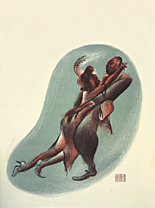 Complete with in-text illustrations and 24 tipped-in, full-page original lithographs, most in color; 19 depict Harlem residents, 6 depict Balinese dancers. Introductory text by William Saroyan. 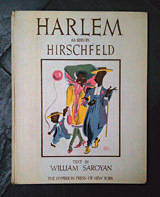 Printed by The Hyperion Press, New York. 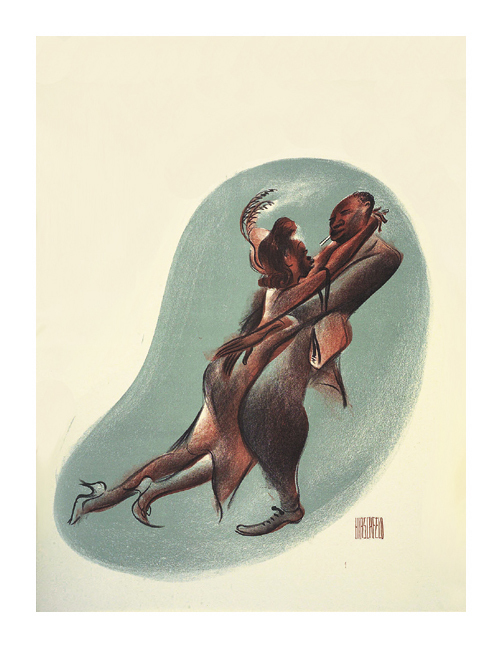 Lindy Hop - - 1941, Color Lithograph. Edition 1000. Signed in the stone, lower right. Image size 10 x 7 1/2 inches (254 x 191 mm); sheet size 11 7/8 x 9 1/8 inches (302 x 232 mm). A fine, clean impression, with fresh colors, on cream wove paper, the full sheet attached to the original support page with printed grey border rule. Toning from the original glue strip (1/8 inch) along the left sheet edge, otherwise in excellent condition. 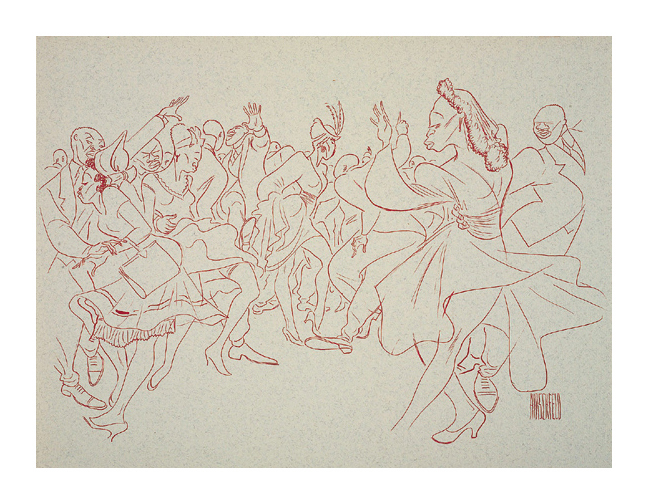 From Harlem as Seen by Hirschfeld, The Hyperion Press, New York, 1941. 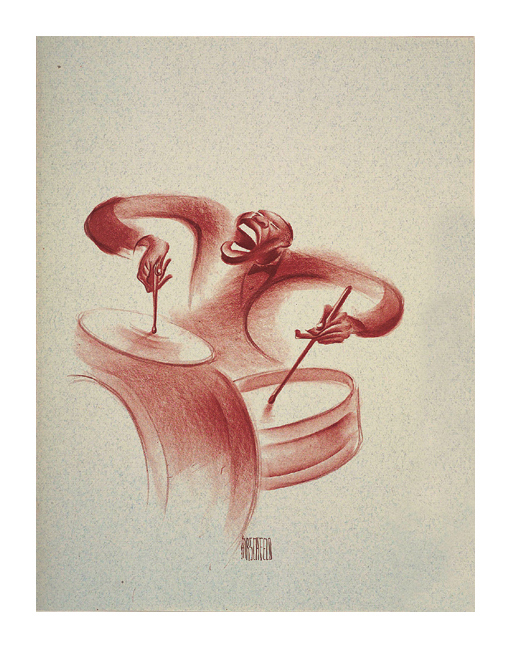 Solid Sender - - 1941, Color Lithograph. Edition 1000. Signed in the stone, lower center. Image size 7 5/8 x 7 inches (194 x 178 mm); sheet size 11 7/8 x 9 1/8 inches (302 x 232 mm). A fine, clean impression, with fresh colors, on fibrous grey wove paper, the full sheet attached to the original support page with printed grey border rule. Toning from the original glue strip (1/8 inch) along the left sheet edge, otherwise in excellent condition. 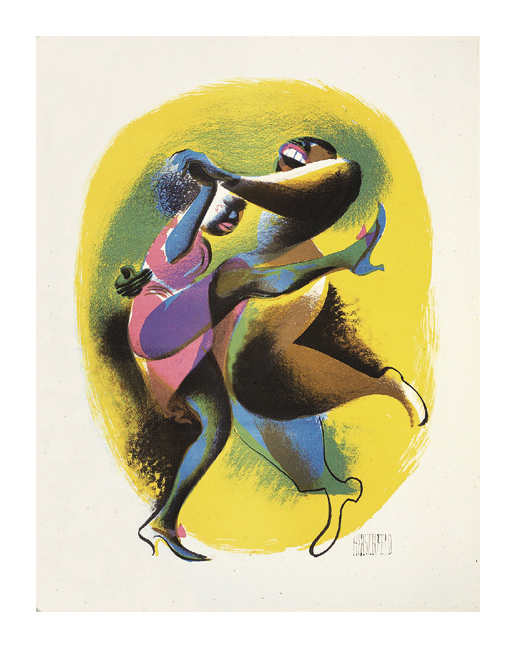 Scufflin' In - - 1941, Color Lithograph. 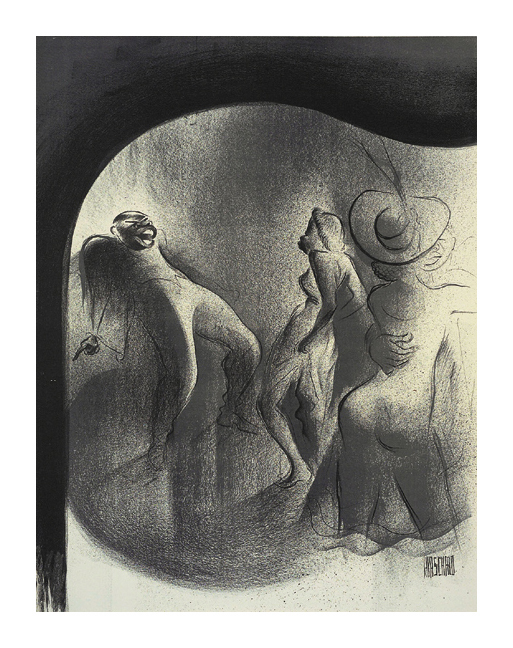 Image size 8 3/4 x 7 1/2 inches (222 x 191 mm); sheet size 11 7/8 x 9 1/8 inches (302 x 232 mm). A fine, clean impression, with fresh colors, on cream laid paper, the full sheet attached to the original support page with printed grey border rule. Toning from the original glue strip (1/8 inch) along the left sheet edge, otherwise in excellent condition. 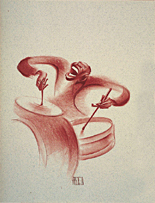 Boogie-Woogie - - 1941, Lithograph. 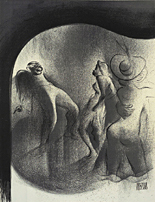 Image size 12 x 9 1/8 inches (305 x 232 mm). A fine, clean impression, with fresh colors, on cream wove paper, in excellent condition; the full sheet attached to the original support page with printed grey border rule. 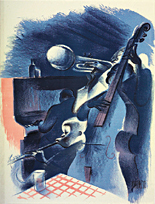 Jam Session - - 1941, Color Lithograph. Image size 11 5/8 x 9 inches (295 x 229 mm); sheet size 11 7/8 x 9 inches (302 x 229 mm). 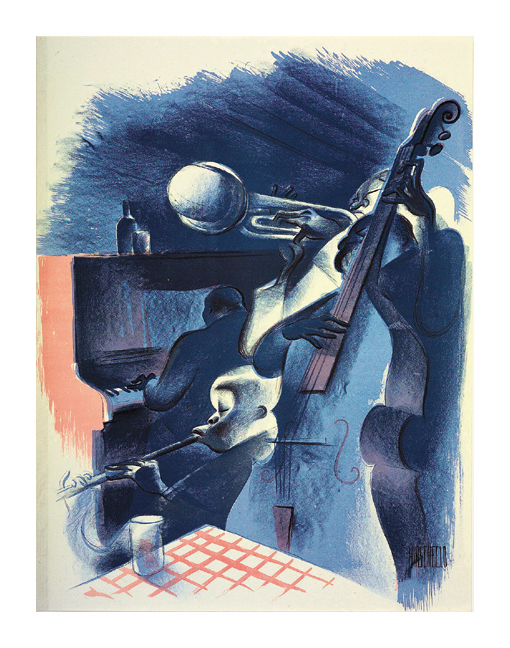 Slow Blues - - 1941, Lithograph. Image size 8 7/8 x 11 7/8 inches (225 x 302 mm); sheet size 9 1/8 x 11 7/8 inches (232 x 302 mm). A fine, clean impression, with fresh colors, on cream wove paper, the full sheet attached to the original support page with printed grey border rule. Toning from the original glue strip (1/8 inch) along the top sheet edge, otherwise in excellent condition. 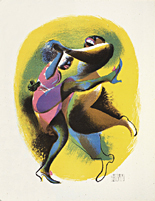 Stompin' at the Savoy - - 1941, Color Lithograph. Image size 7 1/2 x 11 3/4 inches (191 x 298 mm); sheet size 9 1/8 x 11 7/8 inches (232 x 302 mm). A fine, clean impression, with fresh colors, on fibrous grey wove paper, the full sheet attached to the original support page with printed grey border rule. Toning from the original glue strip (1/8 inch) along the top sheet edge, otherwise in excellent condition.